Fall Fun with Fulbright and Family! Boston Fulbright Scholars and their families enjoyed a beautiful Fall Foliage tour To Wachusett Meadow Audubon Sanctuary in Princeton, Massachusetts. Scholars enjoyed a short hike to a boulder that had been deposited by an ancient glacier and a tour by the caretaker for the Wildlife Sanctuary. The Fulbright party continued to Apple Fest. There were food and craft vendors, musical performances, and the Skyride ski lift to the observation tower at the top of the mountain. The foliage was at its peak with beautiful bright colors. Fall is a truly magnificent season to enjoy New England’s vibrant flora. Fulbright Scholars and their families began their adventure at The House of Seven Gables where tour guides divided them into small, interactive groups. The house, a Jacobean style mansion built by the sea in 1668, is a unique piece of New England history. Scholars learned about the property, its inhabitants, and enjoyed taking pictures of the property. Exploring the House of Seven Gables gardens. The groups then ventured to Pickering Wharf, a beautiful spot on the harbor filled with restaurants and small shops, where scholars ate lunch and had the option to explore the USS Friendship. This ship is a replica of the Salem East Indiaman Friendship, launched in 1797 with 15 voyages to Batavia, India, China, South America, the Caribbean, England, Germany, the Mediterranean, and Russia. The journey of our Fulbright crew continued to The Peabody Essex Museum, one of the largest and most dynamic art museums in the nation. Scholars were able to experience the museum at their leisure. 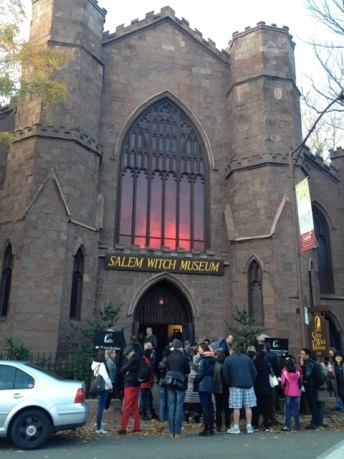 They then walked to the Salem Witch Museum. At this final destination on the tour, scholars learned about the Salem Witch Trials of the 1600s and the different varieties of witches. “Strandbeast” special exhibit from The Netherlands at the Peabody Essex Museum. 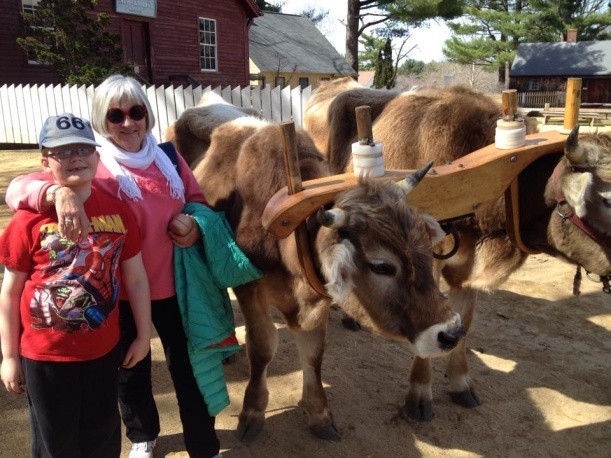 Boston area Fulbright Visiting Scholars traveled back in time to 1830’s rural New England at Sturbridge Village, a living history museum in Sturbridge, Massachussetts. 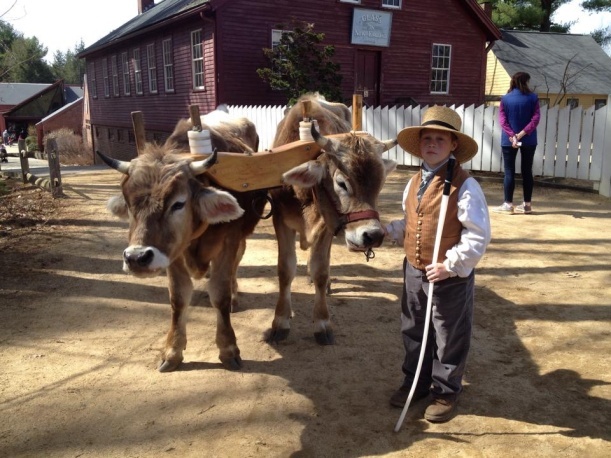 Costumed actors, historic buildings and activities such as pottery making, smithery, weaving, and cooking, brought Massachussetts history to life in this small village. A local schoolchild in period clothing. Scholars spent the day enjoying aspects of 1830s life. They took horse-drawn rides in stagecoaches and hay wagons. Some watched the making of butter in a wooden churn and tasted the final product. Others learned about the history and crafts of the period through books in the General Store and Bookshop. Still others enjoyed taking hiking trails around the millpond and through wooded fields. Visiting Scholars enjoy a hay ride. One highlight of the day was the annual springtime Family Farm Fest, which featured newborn farm animals and activities for school children. Everyone enjoyed playing with lambs and bunnies, while staff in period costume explained the historical context of farm activities. Barbara Harrison of WorldBoston with a young Fulbrighter. 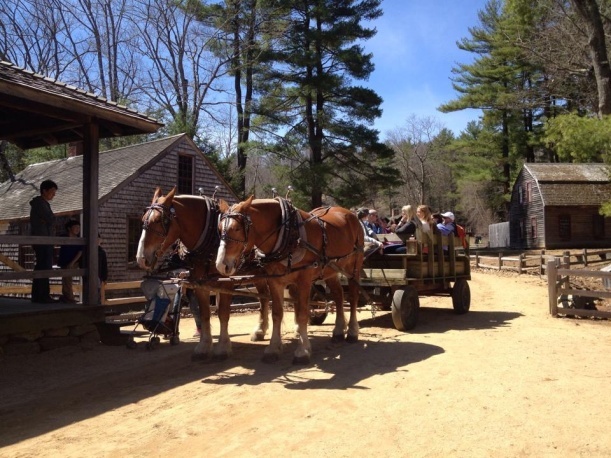 The day was packed with learning about Massacussetts history and culture. Several Scholars commented that although they spent the day at the village, they could spend many more enjoying the many things to see and do! It’s been said that music can bridge all divides, and Fulbright Visiting Scholars recently saw this theme in action at the Berklee College of Music’s International Folk Music Festival. Scholars began the evening with a casual dinner at the local King’s Bowl where they talked over pizza and appetizers, then headed to the Berklee Performance Center for the concert. 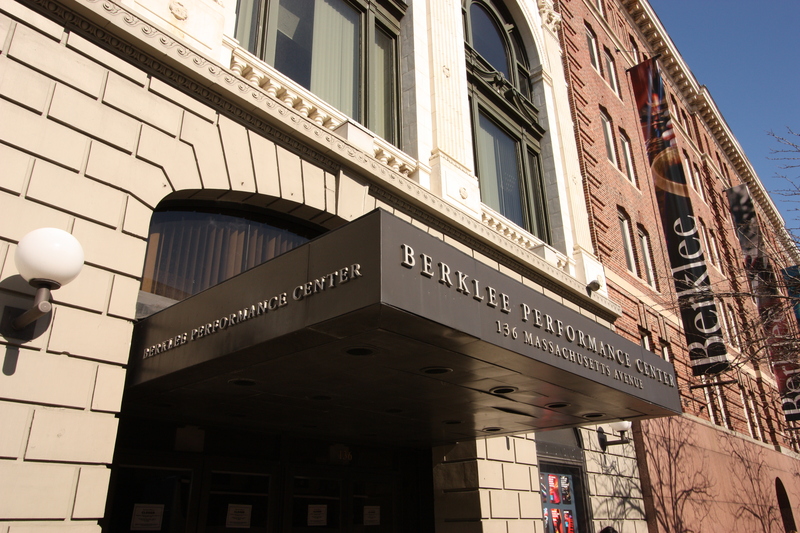 The Berklee Performance Center hosted the lively festival. At this spectacular festival, international students performed music from across the globe to a lively audience. The concert was a wonderful way for scholars to hear music from their home countries and experience new genres, and showed the value of music in bringing people closer together. 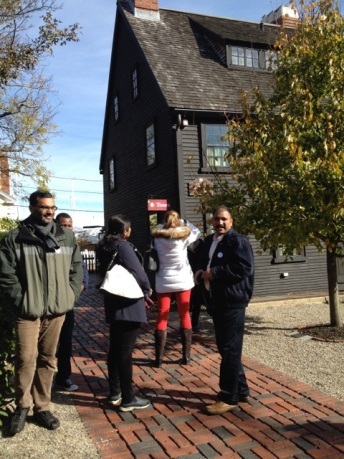 November 8: Boston area Fulbright Scholars and their family members discovered New England history on a tour of Salem, Massachusetts. Through visits to local museums scholars gained a deeper appreciation of New England history, maritime traditions and the colonial origins of Halloween. The tour began with a visit to House of the Seven Gables.The house, built in 1668 by sea captain and merchant, John Turner, was made famous through American author Nathaniel Hawthorne’s 1851 novel, The House of the Seven Gables. Scholars enjoyed a guided tour of the gardens, house and many of its secret passageways. Visiting Scholars at the House of the Seven Gables. 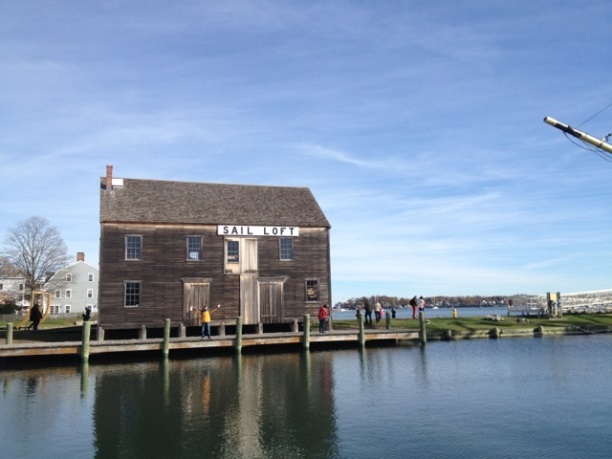 Next, scholars walked to Pickering Wharf, a historic seaside area, where they shopped, ate lunch, and explored nearby attractions. Several Scholars visited the U.S.S. Friendship, a reproduction of a 1797 trading ship. Scholars then visited the Peabody Essex Museum, one of the oldest continuously operating museums in the United States. Scholars freely explored the museum’s collections of art from around the world and even had a chance to make some jewelry. 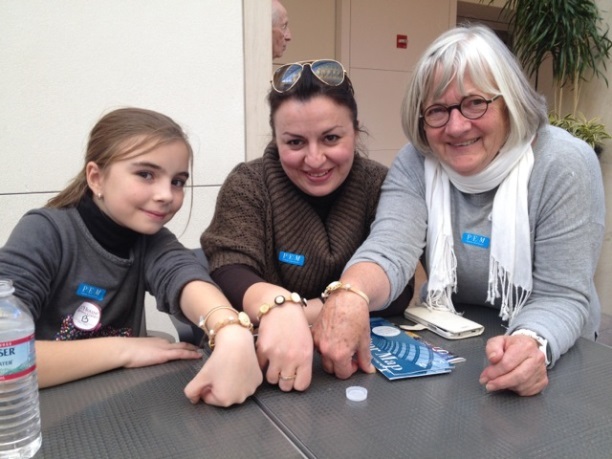 Fulbright family members proudly display their handmade jewelry. The day ended with a visit to the Salem Witch Museum, which introduced Scholars to the tragic events of the 17th century Salem witch trials. The museum also included an overview of the evolving concept of witches throughout history. Waiting outside the Salem Witch Museum. 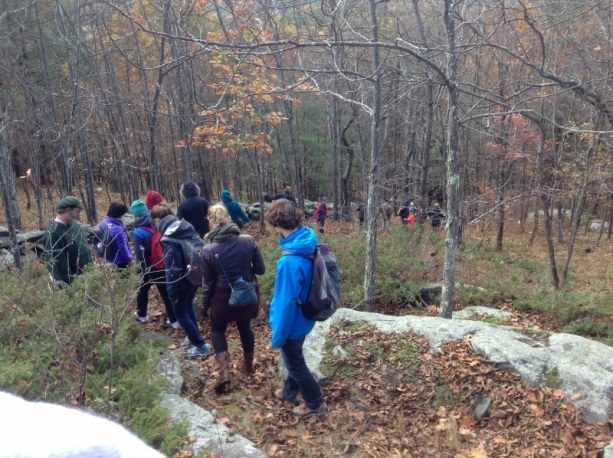 October 19: Boston-area Fulbright Visiting Scholars and their family members spent a day taking in the New England fall colors at a nearby nature sanctuary and festival. Scholars began the day at the Audobon Society’s “Wachusett Meadow Wildlife Sanctuary,” a former farmstead surrounded by woodlands, wetlands and meadows. Naturalists led the group on a tour of the farmstead and surrounding nature, where they had the chance to see a giant boulder deposited by an ancient glacier. Children had a chance to feed the farm’s sheep and enjoyed running in the fields and playing with the milkweed fluff that blowed around them. 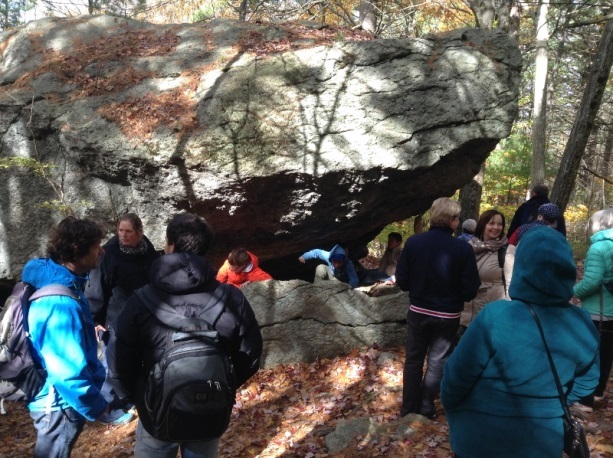 Scholars see an ancient glacial rock at the Audobon Sanctuary. Walking the trails at the Audobon Sanctuary. Next Scholars went to the Wachusett Mountain Applefest where they enjoyed food, rides, games, shopping and performances. 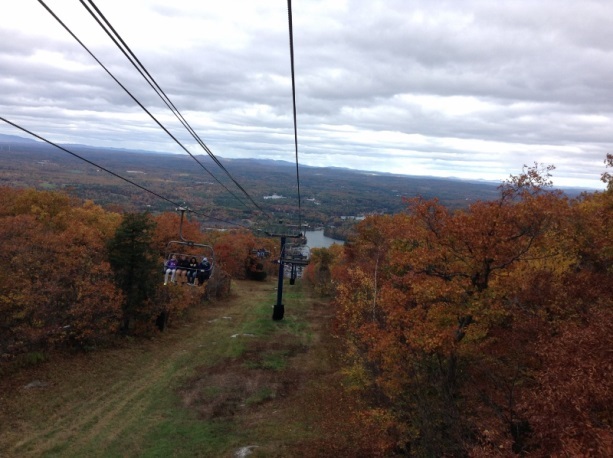 They ended the trip with a Skyride lift to the mountain summit where, surrounded by fall colors, they enjoyed a clear view all the way to Boston and New Hampshire. View of New Hampshire mountains from the Skyride. 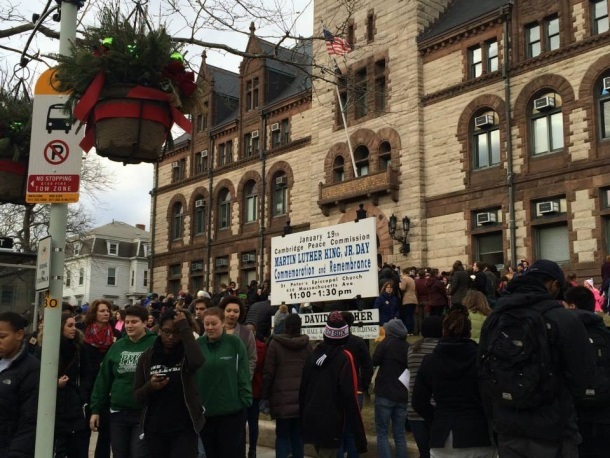 January 17 &19, 2015: Scholars and their family members in the Boston area had two exciting opportunities to understand the meaning of Martin Luther King Day. Scholars and their family were treated to the amazing voices of the Harlem Gospel Choir at their “27th Annual Joyful Noise” Concert at the historic Sanders Theatre at Harvard University. The rousing concert honored the life and legacy of Dr. Martin Luther King Jr. and included exciting opportunities for audience participation. Visiting Scholars and family also spent an afternoon volunteering at “Many Helping Hands,” a day of service for the city of Cambridge, MA held annually on Martin Luther King Day. After checking into the event, scholars went to three locations to work on different projects. Groups made Valentine’s Day cards for the elderly, stuffed care bags and made blankets and scarves from donated materials. Several participants enthusiastically responded to a request to arrive early in order to receive training in running the day’s activities. They proudly wore their Volunteer T-shirts and helped with activities throughout the day. After volunteering, the group walked to a nearby ice cream parlor and chatted about the day’s activities over frozen treats. Scholars were amazed at how many people who showed up from the community to help out, with volunteers ranging in age from 5 to over 80. Participants gather for the beginning of MLK day volunteering. 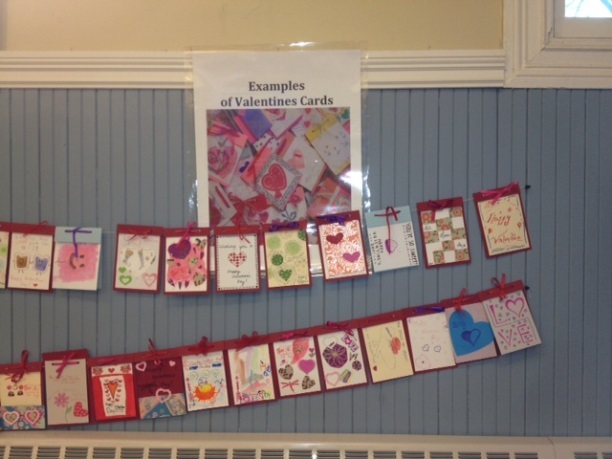 Fulbright-made valentines for the elderly. 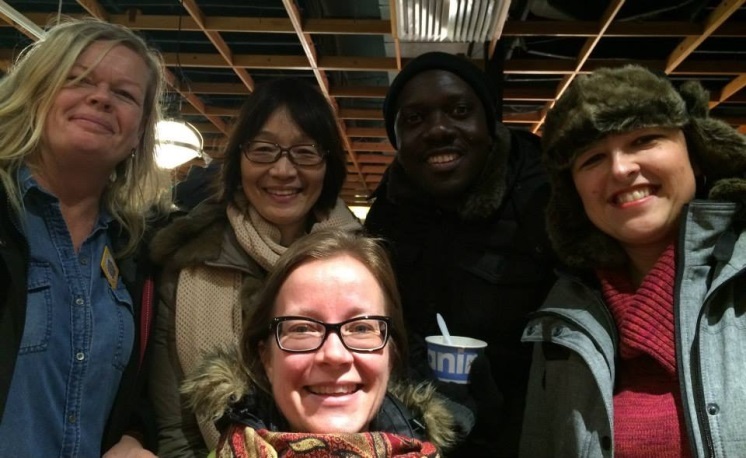 Fulbright Visiting Scholars celebrate a day of community service.